The hotels and on this page are my recommendations for places to stay when visiting Peoria, Surprise or Sun City in Arizona, all of which are in the West Valley. Peoria and Surprise both have multi-use sports complexes where events are held throughout the year. The events that attract the biggest crowds are the Spring Training baseball games, since there are several teams that use those stadiums as their home fields for Cactus League games and practice sessions. If you are also interested in being near the Gila River Arena (formerly Jobing.com Arena) or University of Phoenix Stadium, downtown Peoria is about ten miles from those venues and a few more miles from Surprise, which is west of Peoria. The Glendale addresses put you on the east side of Peoria, and will be closer to Arrowhead Mall. Staying in this part of time will definitely be cheaper than staying in Scottsdale, for example. You might be driving a little farther but it might be worth it! Check out how far it is to drive from Peoria and Surprise to other Valley cities and towns. These Peoria and Surprise, AZ hotels and motels are likely to fill up pretty quickly in the months before Spring Training baseball begins. There are no high end resorts in this part of town -- if you want classier digs, try The Wigwam in Litchfield Park or the resorts in North Scottsdale and take the 101 Loop into Peoria and Surprise. These hotels are generally rated two stars or better. As a general rule, the higher the number of stars, the higher the price. Follow the link provided to read what travelers thought of the hotel. Tip: Many of these hotel chains offer amenities like free wi-fi and continental breakfast included in the rate. Make sure you take that into account when comparing prices. Check guest reviews and prices for Hampton Inn on TripAdvisor. Check guest reviews and prices for La Quinta Inn & Suites on TripAdvisor. Check guest reviews and prices for Residence Inn by Marriott on TripAdvisor. Check guest reviews and prices for Holiday Inn Express on TripAdvisor. Check guest reviews and prices for Comfort Suites Peoria Sports Complex on TripAdvisor. Check guest reviews and prices for Cibola Vista on TripAdvisor. Check guest reviews and prices for Residence Inn Surprise on TripAdvisor. Check guest reviews and prices for Quality Inn & Suites on TripAdvisor. 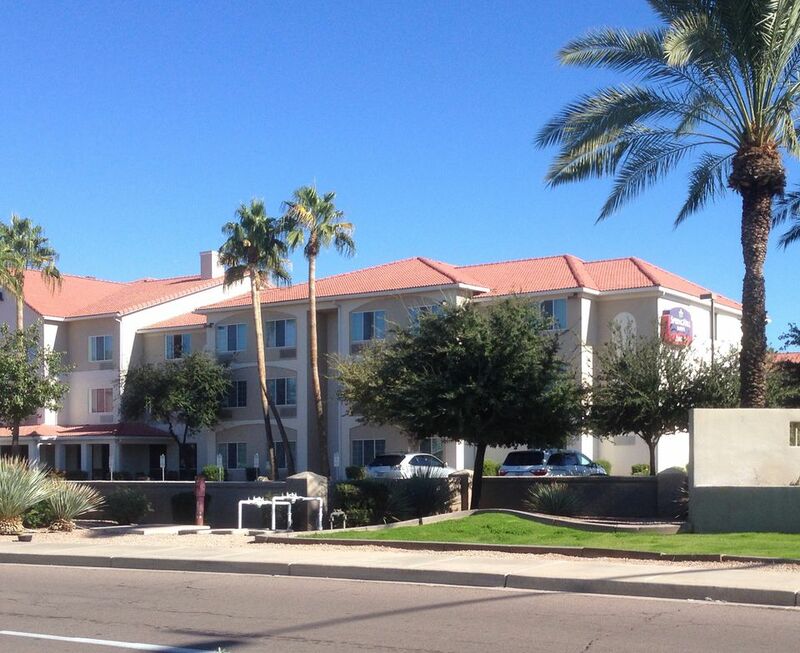 Check guest reviews and prices for Best Western Inn & Suites of Sun City on TripAdvisor. Check guest reviews and prices for Comfort Inn & Suites Surprise on TripAdvisor. Check guest reviews and prices for Hampton Inn Suites on TripAdvisor. Check guest reviews and prices for Days Inn and Suites Surprise on TripAdvisor. Check guest reviews and prices for Windmill Suites on TripAdvisor. Are you visiting Peoria and Surprise to attend Spring Training Baseball games? Here are maps of the Cactus League Stadiums in the Phoenix area. Downtown Scottsdale would be my choice for a place to stay if you need to be centrally located in the Valley, with a relatively easy drive to various parts of town, nearby shopping and attractions, close proximity to the airport and downtown Phoenix. For example, if you are visiting here to attend Cactus League baseball games during Spring Training, and you'll be hitting all the stadiums and not just one or two, Downtown Scottsdale gives you pretty easy access to them all, since the Loop 101 can get you to Peoria and Surprise in the west, and Mesa to the east (via the 202), and city streets can get you to the ones in Scottsdale, Phoenix, and Tempe. Return to the Resorts and Hotels By City index.